I’ve always been partial to contemporary YA fiction. I’ve been reading the genre since long before I fell into the YA age group–and have continued long after I fell out of it. I love the depth of the characters and the drama of their emotions. There’s something timely and relevant about stories featuring flawed, vulnerable, dynamic characters living in the here and now. To me, contemporary YA is as good as it gets, which is why I adore reading it, writing it, and generally immersing myself in it. But lately, I’ve been working on a writing project that’s totally different, yet equally intriguing…Amish YA fiction. The idea of writing an Amish fiction story came to me totally randomly. Almost two years ago, I was reading Allure magazine, and there was an article with fun facts about coming of age. One of the blurbs mentioned Rumspringa, the Amish rite of passage. And **bam! ** I decided it would be awesome to write a story about that, and the rest is history. I grew up in Pennsylvania, and had plenty of experience with the Amish. I saw some at a grocery store in Edinboro, and others driving buggies when my family and I cruised the country roads. When we drove through Lancaster, I admired an Amish schoolhouse, with its matching boys’ and girls’ outhouses. To me, the Amish culture seemed like a slice of history. Seeing the Amish in action was like a time machine; I felt like I was watching pioneers from the 1800s. Even though I definitely consider myself a modern girl, I’ve always been more than a little nostalgic for bygone times. Maybe a lot of us are, and that’s why all things Amish, from books to TV shows, have been so hot lately. 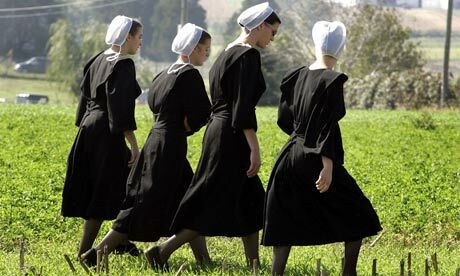 I started thinking about other reasons why Amish fiction is hot, and here’s what I came up with. It’s Fresh: Amish fiction is still a relatively new genre, and, naturally, whenever a new genre emerges it becomes a literary hot spot. It’s Interesting: Amish society is fascinating since it’s so foreign to many of us. While the rest of the world seems to keep striving toward a materialistic rut, the Amish emphasize that it’s a gift to be simple. The tenets of the Amish are refreshing, especially in these days of avarice. It’s a New World: To most of us, the world of the Amish is all new. One of the best things about reading fiction is the ability to escape our everyday lives and enter into a totally new environment. Just look at the recent trends of futuristic, dystopian, and / or paranormal fiction–very different from our world, and massively popular with readers. It’s Educational: Amish fiction paints a picture of a society of which we know very little. One of the best things about fiction is that it allows authors to bring foreign and / or historic settings to life. Just look at one of my favorite books, Gone With the Wind. Margaret Mitchell educates us about Civil War-era Southern gentry so well that we feel as though we lived through that time ourselves. Somehow, learning about history or other cultures becomes easier when it’s accompanied by characters to bring everything to life. It Has the Potential for Great Drama: The Amish are very conformist, but Amish youth have a chance to break the mold and experience the outside world during Rumspringa. However, if Amish teens choose ultimately to accept the outside world, they will be shunned by their families. The teen years are a dramatic, turbulent time for anyone, but for Amish teens, they have the potential to be even more so. Amish teens face the drama of learning about the “English” people, and they have to reconcile their new experiences with their upbringing. They also face the terrifying possibility of being ostracized by the very society and family that brought them up. The stakes are high for these kids, which makes Amish fiction a great place for the drama that drives storylines.